Family will always come first for Linda Chung (鍾嘉欣). The TVB actress, who is currently residing in Vancouver, Canada with her husband and her two children, recently returned to Hong Kong to film an infant milk commercial. Linda will personally write and perform the theme song of the commercial, expressing that both the new single and the commercial film are inspired by her own experiences as a mother. As she wrote the song, Linda recalled her experiences growing up as a child and becoming a famous celebrity at an early age. Her many experiences helped her grow as a person, and she hopes that her daughter will similarly undertake many different adventures as she grows older. Linda will make sure to be her children’s biggest supporter, so they can pursue their talents and have a happy and successful childhood. @wm2017 me too!!! Her fadan generations are the milestone of tvb’s decline. Im currently re-watching forensic heroes and Linda’s character is so cringeworthy. That innocent face…..goshhhhh. @alicesky I don’t remember much of the Forensic Heroes series. Her worst character for me was the one she paired up w/Ruco don’t remember the series name either but I heard it had part 2 and I didn’t even bother. I am not sure if it’s her, her character or a combination of everything but her role there was sooooo bad. Basically, I couldn’t find anything good of her character in that series but I never like any of roles to begin with. The Tiger Cubs series was equally bad gosh. lol… I like Ruco but I just couldn’t finish it. It was just that bad for me. @wm2017 i guess its brothers keeper?? Yea…bcoz of her acting in that series, Kristal Tin won BA that year lol, it was ironic Kristal played as supporting role but gladly tvb made a good decision ever. Now u mentioned Tiger cubs, i was like Jesus..bring back Jessica Hsuan. 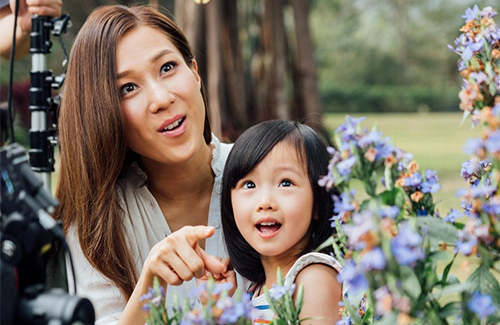 Linda Chung’s daughter is a lot prettier in the above photo, not as chubby as when she was young. She looks quite different too, more like Linda than her father, Jeremy Leung. @orchid123 I don’t think that is Linda’s daughter, or she has changed significantly from when she was younger. Wouldnt be surprised if she’s a young model who filmed a commercial with Linda. @orchid123 that is not Linda’s daughter. her daughter looks more like Jeremy. in fact both kids have their father’s colour. so relieved to know she will not be acting. Thank you for letting me know. The little girl does not look like Linda’s daughter at all, but I thought Linda’s daughter has changed so much. I know she used to look like her father, Jeremy Leung. Both of Linda’s children look very much like their father now. Perhaps they will grow more like Linda in future. that’s great news. thank god! I was hoping she could star with Raymond again now that he’s back. I guess my childhood TVB memories are over now.